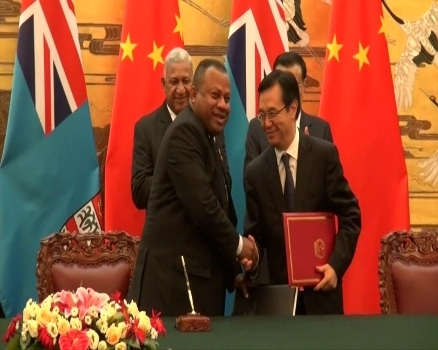 Fiji and China have signed three agreements which will now pave the way for more cooperation between the two countries. The first signing was for an agreement on economic and technical cooperation between the two governments. It was signed by Fiji’s Agriculture Minister Inia Seruiratu and a Chinese State Official. The second was an MOU regarding a joint feasibility study on a China-Fiji Free Trade Agreement between Fiji’s Ministry of Trade and China Ministry of Commerce. The third signing was an MOU on Sports Corporation between General Administration of Sports of China and Fiji’s Ministry of Youth and Sports. It was signed by Fiji’s Ambassador to China Iowane Naivalurua. The signing of the MOU’s were done following Prime Minister Voreqe Bainimarama’s meeting with the Chinese Premier this week.